Memberships at Kevin Chevell's Inside Fitness are easy - when you join it's easy, and if you want to change or cancel, it's easy! Don't worry, we can fix it. You can come along as a single member, join with a friend or join as a family. We even have School Student memberships available. We focus on exercise guidance for the OVER 55's, who are still very much young at heart. We make these fees very manageable. Exercise programs provided - Whilst your membership at Inside Fitness provides everyday use, we also provide a unique approach of teaching exercise which is proven. When you first join, we would like to learn about your exercise background, so that we can get an understanding of your fitness levels and of any possible restrictions that may be specific to you. From there we explain the comparisons between the "conventional approach" to exercise instruction (i.e. spend 40-60 minutes, 2-3 times a week), versus the unique and proven methods developed by Kevin Chevell over more than 30 years of observing/teaching exercise and more importantly, what improvements you can expect by following one exercise method versus another. As a member, you are welcome to have your questions answered and our guidance as regularly as you require. Our advice is to re-book to have your exercise progress reviewed after 20-25 visits at each level. Don't think you're too old or past it. I have seen every age and every level of fitness, and I get help you immensely. We are constantly working on improving ourselves to provide better service to you. I know every fitness business will say this, and they mean well. But then, why do such a large proportion of people drop out of exercise so soon (85% in three months). Nobody starts on a regular exercise program thinking they will only last 8-12 short weeks, before giving it up. 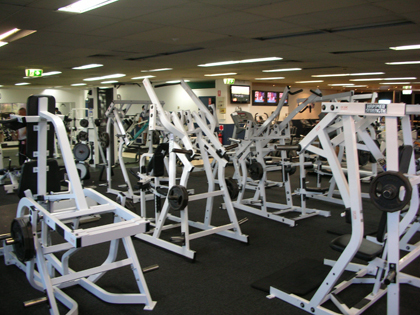 In Australia, the USA and Canada, the average fitness club member remains for 12-14 months. Here, at inside fitness the average is 22 months. Why would our members stay with us nearly twice as long if we weren't doing something different? The answer is loyalty. We are loyal to our customers, and in turn our customers are loyal to us. If you can't do what you promised for your customers when you got them to join, then you do more. This is the advantage of being owner/operated. Schools Memberships - If you are a current student at one of the schools that has supported Inside Fitness with school sport for the past 25 years, then you are eligible to join yourself and family under the Schools Membership Scheme. Just ask a staff member for details. Nominated schools include St. Dominic's College, Cambridge Park High, Cranebrook High, St Pauls Grammar, Penrith High, Jamison High, Nepean High, Penrith Anglican College, Caroline Chisholm, McCarthy Catholic College, John Wycliffe, Kingswood High. There are no joining fees when you join inside fitness. There never has been. Pay two months of your membership when you join, then monthly thereafter until you wish to cancel. Our "Join with a FRIEND" membership includes 2 persons. All memberships are paid on a monthly basis through secure direct debit system. We also provide short term memberships for 7 days or 30 days, if you just want to try us out, or are in town for a short time.